Hope everyone has a hapy and safe New Year's Eve. 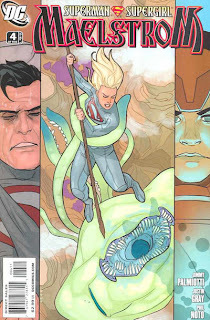 The Superman/Supergirl: Maelstrom mini-series continues to gain momentum as it approaches it's finale next month. Issue #4 is the penultimate chapter and again showcases the relationship between the super cousins. After a lackluster opening, each issue has improved on the last and this issue continued that trend. One thing that does seem to lower the grade overall are the occasional deus ex machina moments or events that seem forced to simply move the plot along. 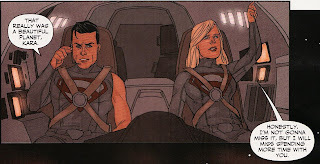 For example, the impetus to go to the red sun planet was an improbable complete thrashing of Supergirl by Maelstrom. The creative team probably needed a reason to get the cousins off Earth and alone so that somewhat forced scene accomplished that. This issue's moment? Well, don't ask me how Supergirl is able to communicate enough with the scavenging aliens from last issue to get them to stop pillaging the ship *and* to give her the antidote for the poison dart they hit Superman with last issue. But somehow her gesticulations get the message across. In fact, doesn't it seem strange to poison Superman on the last page of last issue to only have him so easily cured on the second page of this issue? Well, this issue is about Supergirl going out on her own and succeeding. To accomplish that Superman needs to be near incapacitated. So poisoning him and curing him but having him need to 'sleep it off' allows Kara to show some independence. But that cure seemed somewhat contrived. 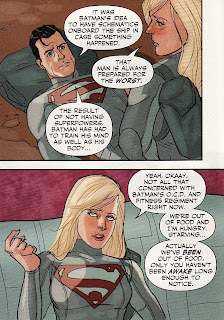 Indeed, Superman has been unconscious for the better part of 4 days leaving Kara in charge to guard him and fix the ship. Thanks goodness Batman told Superman to bring schematics. I like Kara's eye rolling over Batman's obsessive personality. Throughout this trip, Supergirl has shown a little bit of a willful streak. She is young and opinionated. But one thing that I have liked is that she has never really gone over the line. Sarcastic ...yes. Bitchy? Close-minded? Immature? No, no, and no. It is hard to jibe *this* Kara with the one from the first issue. 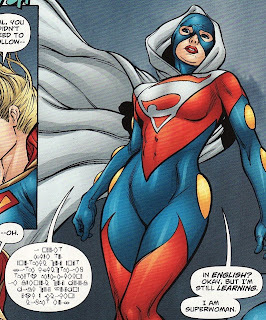 It thankfully is definitely not the bitchy immature Kara from the Palmiotti/Gray penned Supergirl #12. Superman passes out again forcing Kara to finally risk leaving him alone to scrounge for food. She battles a flying jellyfish-like bird and kills it with a spear. Actually, she sort of pops it covering herself in goo. It's a funny scene. I love the 'gross ...oh wait dinner' moment of clarity. When Kara returns, Superman is awake and looking a bit better. She again calls him to the carpet for taking them to this dangerous planet. She should call him on it! Despite his reminders that there has been personal growth, it does not take away any of the dangers Kal and Kara have confronted. They truly are lucky to be getting out alive and relatively intact. Kara again states she prefers to be bulletproof. 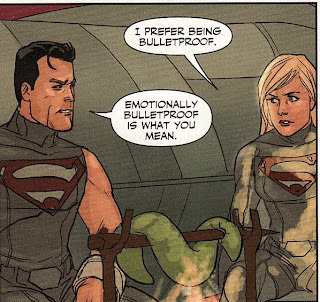 Superman counters with she wants to be emotionally bulletproof. While, at times, she has acted this way on the planet, Kara certainly wasn't emotionally bulletproof as she cried on the moon in issue #1. 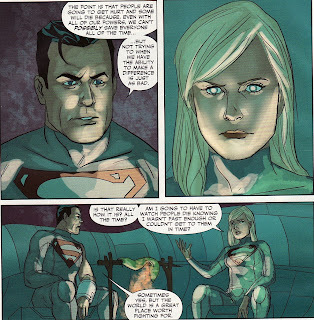 Not falling for the bait, Supergirl tells Superman she doesn't want to talk about anything 'touchy-feely'. What follows is a pretty funny conversation as the two struggle to come up with something to talk about. Superman brings up boys *and* Jimmy Olsen. Kara shoots that down. She asks what Aquaman eats for dinner. It can't be fish. Wouldn't he hear them in pain as they are being cooked? I don't know about you, but I have been in situations where I have been alone with someone struggling to end the silence and struggling to find a topic of conversation. But eventually 'the big speech' happens. 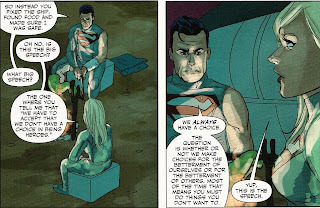 Superman tells Kara that they have a choice of being a hero but it often means doing things you don't want to do. 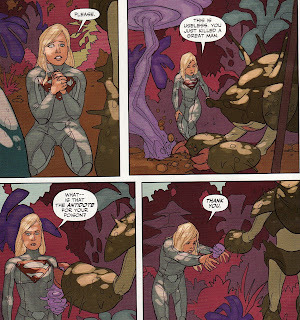 For example, Kara most likely did not want to repair the ship, hunt for food, and protect Superman, but that was heroic. Just look at Kara's face. You can almost hear her sighing. Superman continues that despite their best efforts, people will still die. But it is better to have tried to be a hero than not try at all. Again, the whole reason for this trip was Kara's interaction with Maelstrom. Didn't she try to save people in that encounter? She didn't sit back. She did everything she could, even trying to rescue people while in pretty bad shape. So I don't know why this lesson needed to be taught now, but the actual conversation felt natural and flowed nicely. The camping trip comes to an end as repairs are finished. Kara tells Kal that she will miss spending time with him and he says they can work on that. Dispersed throughout they issue are fairly pedestrian scenes of the Female Furies wreaking havoc in Metropolis. Stuff gets destroyed, citizens get killed, and Lois and Jimmy end up in the mitts of Maelstrom. Hey ... wasn't Power Girl supposed to be watching Metropolis during the camping trip? I guess that was conveniently forgotten to lead into the showdown next issue. I have to admit, I actually didn't like the Metropolis pages because I was enjoying the cousins' conversation so much. 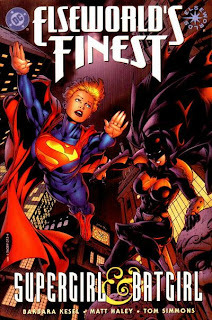 If you put this series in it's proper place, as an early adventure of Supergirl, then all that conversation makes perfect sense. Of course Supergirl would need to learn to be independent, not rely on her powers too much, and understand the pitfalls of super-heroics. And her responses, while a bit biting, also made sense for an adolescent who thinks they understand things but really still needs the wisdom of experience. The problem is trying to corroborate that interaction, those conversations, with the events of the first issue. It is very difficult to reconcile the first issue with the need for these lessons. If the reason for the trip was physical training, so be it. But clearly Superman had more on the agenda. I almost wish I hadn't read the first issue. It would make this an overall better read. I also don't see the need to go to such an obviously hostile planet to get a point across. Let's face it, there were plenty of ways that either Kara or Kal could have died out there. You think Superman would have the fortitude to admit that this trip was more dangerous than he thought it would be. All that said, the scenes where Superman and Supergirl chat were well done. That is how I think their voices and interactions would sound like. 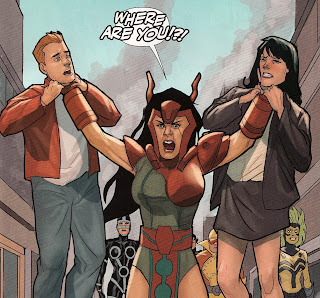 It almost makes me feel like the inevitable brawl next issue in unnecessary. And, as stated before, I just love Phil Noto art. He simply does a fantastic Kara. She looked great this issue. This was the strongest issue yet of this mini-series, each issue an improvement on the last. Newsarama has started a series of articles looking forward to 2009. 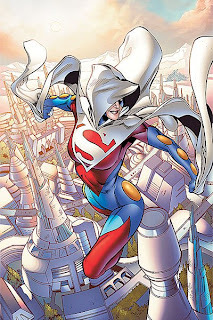 The first part was '9 characters to watch in 2009' and Supergirl was there (http://www.newsarama.com/comics/120829-9-Characters.html ). Although she is the female counterpart to DC's signature superhero, she's never quite lived up to her birthright until now. Her ongoing series has finally (finally!) gotten its footing with writer Sterling Gates, and Supergirl is emerging as a key part of the larger DC Universe not as Superman's proverbial “kid sister” but as her own person. Far from a Superman in women's clothing, Supergirl has begun to emerge and reach her full potential – and her fans couldn't be happier. The next part was '9 creators to watch in 2009' and Sterling Gates was there ( http://www.newsarama.com/comics/120830-9-Creators.html ). Like Bendis' endorsement for Jonathan Hickman, Sterling Gates can credit Geoff Johns for propelling him to the big leagues of superhero comics. 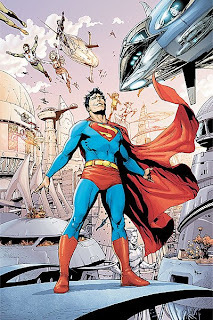 From debuting at DC in December 2007, now he's writing a re-invigorates Supergirl series and is considered a right-hand man for DC comics architect Geoff Johns. Two months shy of his 28th birthday, his stellar work on Supergirl is looking to be a launching pad for a formidable comics career. Here is hoping that Jamal Igle gets a nod in the inevitable '9 artists to watch' piece. As has been said elsewhere, it just feels good to be a Supergirl fan right now. Everything seems to be on the rise. With the holiday behind us, it's time to get back to work. 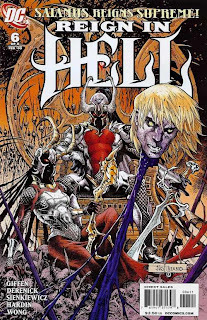 Reign in Hell #6 was released on Christmas Eve, a somewhat ironic shipping date. You may recall that the only reason I am buying this mini is because Linda Danvers plays a part in it. I have little interest and only slight knowledge of the mystical characters in the DCU. 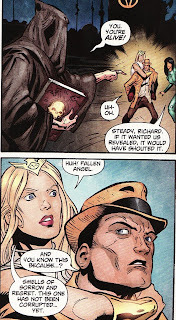 You also may recall that Linda has not appeared since an awkward couple of pages in Reign in Hell #1. So I will be honest, I have read the issues prior to this one but probably not as closely as I should have. I think I have reached the point in this mini-series where I need to pull out all the issues and read them as a whole. The truth is a lot seems to happen with each issue but it seems a little 'all over the map'. Plus it is difficult to tell who is who much of the time as the armies of Purgatory and Hell both look similar. And frankly, I don't know if I 100% understand the reasoning behind the individual hero's desires to join the fray. All that said, this issue gets a full review ... Linda finally shows up again, albeit in the Doctor Occult back-up story. As for the main story ... well a lot happens again. Some of it is noteworthy. First off, Dr. Fate battles Lady Blaze and absolutely fries her, leaving her little more than a skeleton with meager flesh. Ummm ... since she is on the Purgatory side does that mean Dr. Fate is fighting for Hell? Or should I simply treat this war as a free-for-all? I mean I guess I wouldn't want to be fighting for Neron or Satanus. In perhaps the most vicious sequence, Zatanna takes on Lobo hoping to avenge the death of Zatara. She pulls no punches having her magic 'flay the skins from his bones' and more succinctly 'bleed'. 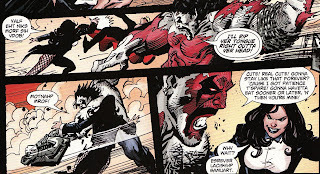 Lobo never is able to get a hand on her, so he goes after her friends. Lobo goads Zatanna throughout the fight knowing she won't ever use a death spell on him. 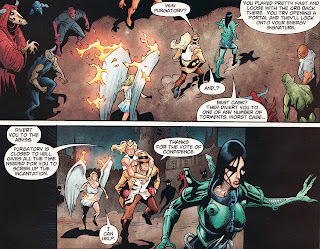 Realizing at best this is a stalemate since she won't kill him, Zatanna freezes Lobo and takes off with her friends. Lobo vows revenge saying he will hunt her forever if he needs to. Interesting new dynamic there. In the mean time, Satanus reveals his grand plan. While he does not state what his true objective is, he does dismiss his initial concept of remaking Hell into a place of redemption as folly. He knew his troops would be routed by the forces of Hell. 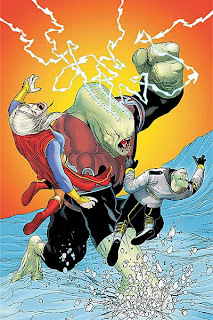 But they were only fodder while he pumped the underworld air with a viral mutagen which can revert demon to man (the result of reverse engineering his DMN drug from way back in the Superman comic). Satanus tricks Neron into a one-on-one fight. And when Neron gets close enough, Satanus triggers the virus with the key word 'Shazam' (nice touch there). Satanus knows that Neron's strength is solely based on the powers of the demons under him. When those demons suddenly become powerless men, Neron loses their power as well and reverts to a Gollum looking creature. Satanus declares victory and beheads Neron. Hell is now his! Like I said, a lot always happens here. Sort of interesting developments here. But onto the back story. In the back up feature, Dr. Occult continues his search in Hell for Rose, the female soul which has been bonded with his. His guide is old Superboy villain the Yellow Peri. Occult finds Rose as a leader in the resistance in Hell. Rose refuses to leave the fight and go with him. Later, the three of them come across a hooded figure. Peri immediately calls her 'Fallen Angel' because of the smells of sorrow and regret. She does say that the being is not corrupted ... yet. 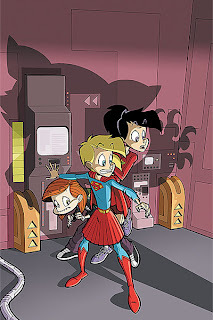 Of course, Linda had been the receptacle of one of the three Earth Angels in Peter David's Supergirl series. She was the Angel of Justice. She was later stripped of those powers which were given to the being Twilight. And David started a series called Fallen Angel which was purported to be (actually believed to be by me) the continuation of Linda's story. So having Peri call this being Fallen Angel struck a chord a bit. The figure drops the cloak. 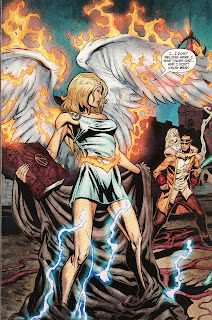 There she is .... Linda Danvers .... fiery angel wings and all! 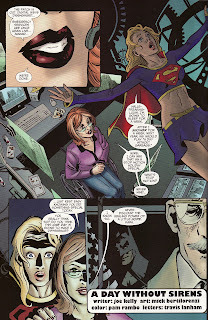 Dr. Occult immediately calls her Supergirl and Linda answers 'Yes, no .... it's a long story'. Well this is a far far cry from Didio saying Linda/Matrix was out of continuity earlier in 2008. Someone actually recognizes ... verifies ... that Linda was Supergirl! Linda seems a bit confused however. While Rose continues to rebuff Occult's pleas to join him, Linda keeps telling them she can help them in their causes. But why is Linda there anyways? 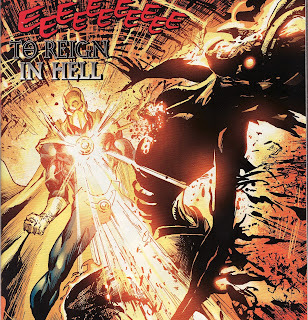 Remember, she was taken to Hell in issue #1 when Lilith culled all her agents on Earth. Linda tells them that she was brought to Hell by Lilith to fight. But Linda did not know how she could have been one of Lilith's agents and so she simply ran. Sounds a bit too easy, don't you think? Why would Lilith just let her run unless she wanted her to. The decision gets made that Occult, Peri, and Linda need to get out of the fray and the best place to hide right then is in Purgatory. Rose leads the way. I am completely conflicted with how I feel right now. I love the Linda character. She was tainted by evil in an all too human way but continued to strive to improve herself and help her fellow man. She always tried to do what was truly right even if the results were occasionally disastrous. But she persevered, trying to do what was best only to suffer for it. Even in 'Many Happy Returns' when she is denied her happy life to save the universe, she does it despite the anguish it will cause her. She self-sacrifices. She is a hero. For a long time I bemoaned the fact that DC wanted to sweep her under the rug. As a character she deserved better than that. But I also had the great fear that if someone else wrote her story they would fail her. That they would cheapen her, or make her have a Punisher-like personality, or (worst of all) make her evil. So while I desperately wanted to read more Linda, I also did not want her to come back either. Better her story remain perfect in my mind than be sullied. And so now she is back. And for the moment I am happy. But I have read rumors she is going to become the Queen of Hell. And, for sure, there is potential to make her evil in a less grandiose way. Peri says she hasn't been corrupted 'yet'. And if that happens ... if they make her evil, as a fan, I will be discouraged. And disappointed. And irate. So let the Linda fans be vocal that a blasphemous fate be spared from her. But for now at least let's be happy that she is back. Well, Christmas 2008 was pretty cool here. The supergirls had a great time and my wife was pretty happy with everything I got her. We also were able to spend time with family and friends. Now as for me, I raked in some loot including Iron Man, Dark Knight, and the first season of The Big Bang Theory on DVD. I also got the Infinite Heroes three-pack of figures including Superman, Wonder Girl, and Supergirl as seen above center. Okay, I admit I bought it for myself as a Christmas gift. But she does make a nice new piece to the shrine. 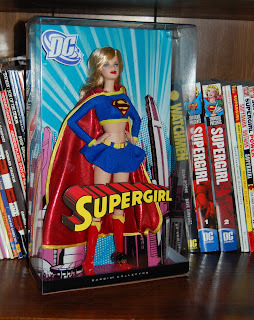 Perhaps the most shocking goodie was this limited edition Barbie Supergirl. First off, I did not even know that this existed. But the most surprising thing? This was a gift from my wife. Mrs. Anj has never quite understood my fascination with Supergirl but she has always sort of tolerated it. To get this addition to the shrine from my loving wife was a gift in itself, a sort of reminder of why I love her so much. She gets me ... and that's wonderful. This doll will have a nice spot next to the deluxe one coming out in February. Merry Christmas and Happy Holidays to everyone! 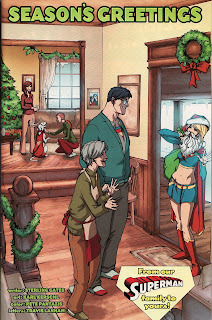 This Santa Kara picture is courtesy of Karl Kerschl from this year's DC Universe Holiday Special. Here is the whole picture, showing a holiday celebration at the Kent farm. I like how Krypto has antlers on. I hope everyone has a safe and fun holiday season. I will probably be off-line for the next few days but should be back on before the new year with the usual conglomeration of reviews, news, and updates. Hopefully some Supergirl-related gift ends up under the tree. But most importantly, THANKS AGAIN to absolutely everyone who visits and posts. This blog has been a great creative outlet for me this last half year ... a true gift ... and you all have been a part of it. Thanks to everyone on the blog who told me about this picture, showcased on the DC Comics homepage. What a nice sentiment, Supergirl and Batgirl are exchanging gifts ... each other's arch-enemy. Or more to the point, Superman and Batman's arch enemies Lex Luthor and The Joker. Both innocently ask 'what did you get me?' It's just a fun little picture for the holidays. It's a great holiday picture by Matt Haley (I think) who drew the excellent Elseworld's Finest:Supergirl and Batgirl comic back in 1998. Of course, this appears to be the Barbara Gordon Batgirl outfit. And that is the Matrix/Linda Supergirl outfit, my personal favorite. So I doubt we can pigeon hole this into any prior continuity. Does this have any bearing on the immediate future of the characters? Who knows?But hey, it's the magic of the season for us to see a picture like this! So Happy Holidays to everyone again! I am a sucker for comic Holiday issues. Call it my inner child. Or maybe it is the fact that the holidays are the one time when my inherent pessimism fades and becomes some meager glimmer of optimism ... I still well up a little bit at the end of 'It's A Wonderful Life' ... but I always buy these issues. Usually the stories are throwbacks to a simpler time when humanity seemed inherently good. Occasionally there is a real gem of a story like the famous 'Should Auld Acquaintance Be Forgot' in Christmas With The Super-Heroes #2 from 1988. 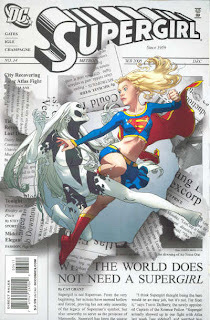 That was the famous post-Crisis 'I am Kara' story, a story I thought about reviewing here but it seemed too obvious. Maybe next year. 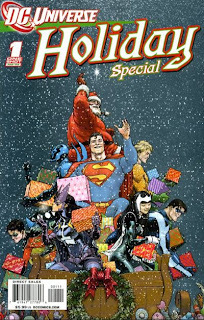 This year, I was impressed with 'A Day Without Sirens' in the DC Universe Holiday Special 2008 . 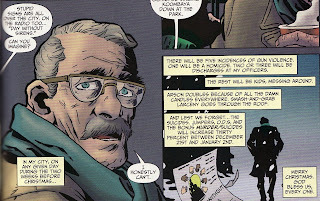 The issue opens in Gotham with Commissioner Gordon hearing about a proposed 'Day Without Sirens' throughout the city. Gordon shrugs it off knowing that in the time just before the holidays there are innumerable crimes. There is no way that the criminals of Gotham would heed such a calling. And yet, the day proceeds in the Police Department with an almost preternatural silence. At first the officers can't believe it. They keep checking the phones. They are called out only once to save a cat from a tree. The news begins to spread throughout the city. The police officers put on holiday music and order lunch. They are seen smiling and laughing with each other, a welcome change from the usual grim business. 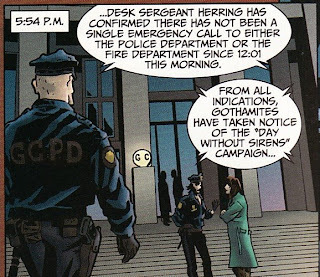 At 11:59PM, Commissioner Gordon holds a press conference applauding the fact that indeed there was a 'Day Without Sirens' in Gotham. In a short but poignant speech, he says 'The only explanation that I can come up with is that grace still lives in our city. We should all walk away today ... carrying a little hope in our pockets." And isn't that what the holidays are all about, that hope that things will get better. That humanity will work together to make this world a better place for the future. That Hope and Grace are alive in all of us and not outdated concepts in this dingy world. But the day ends. At 12:01AM the emergency line lights up. There is a double homicide. "Party's over." Still ... there was that day. Gordon reflects it with Batman, saying if it can happen once it can happen again. That the city can strive for that. 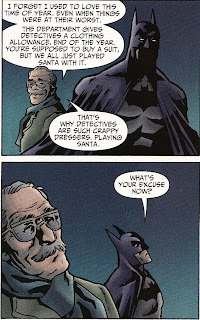 And, in what has to be a true Christmas miracle, Batman actually cracks a joke. If the story ended there, I would have been happy. Heck, it was a near perfect ending. And I probably would have reviewed it here. I was that struck by it. But there was one more page! Turns out that the city had a guardian angel on duty during the 'Day Without Sirens'. Oracle was having all emergency calls forwarded to her during those 24 hours. And when a call came in, she sent out Supergirl as the response team. Kara looks exhausted, saying she is going to shower for a week and then sleep for a week after this day. 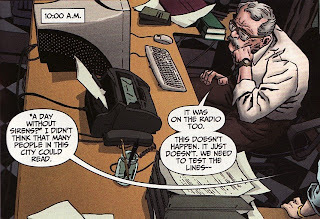 So she probably handled the usual pre-Holiday Gotham volume of calls. But Oracle tells Supergirl that she did something special, that she gave Commissioner Gordon, Batman, the whole city a gift of hope. The inclusion of Kara in such an inspiring story was a little Christmas gift to me. Sometimes hope has to be earned through hard work. And the fact that she and Oracle ... that anyone ... would work so hard for the good of others, with no chance of reward or recognition, well that was this story's 'It's A Wonderful Life' moment of holiday splendor. And perhaps the most shocking thing of all ... the story was written by Joe Kelly! Joe Kelly !!! Could it be that Joe Kelly, whose run on Kara's title I have consistently trashed, wrote a story with Supergirl that I absolutely thoroughly enjoyed? That he wrote an altruistic hard-working Kara who toiled simply for the good of mankind? Now that, my friends, *IS* a Christmas miracle! So ... Mr. Kelly ... if you should see this ... Happy Holidays and Season's Greetings !!! Thank you for a wonderful story! 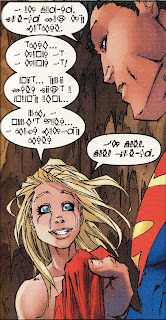 Were you as shocked as I was to see Superwoman speaking fluent Kryptonese in the last issue? Sort of eliminated Linda, Lana, and Cat Grant as candidates for being under the cowl. We're you also like me in wondering just what the heck it was she said? For the record, she said "I don’t mean to bother you but with everything that’s happened in Kandor you look like you could use a friend right now." 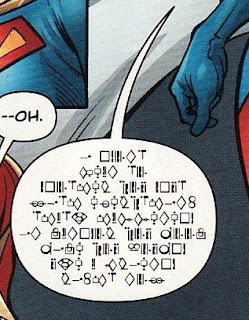 Anyways, I was able to translate because a Kryptonian alphabet key was put in the back of the Superman/Batman Supergirl trade paperback. On re-reading that trade, I was fairly impressed at how much of the first issue is in Kryptonese. When I bought the individual issues, I had no translator and so didn't know exactly what was said. 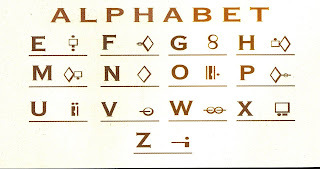 Anyways, just in case the 'all in one' scan above isn't big enough, here is the alphabet split in 2. 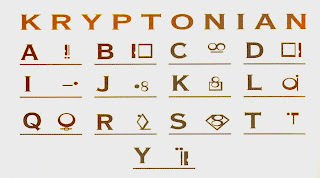 So now you all can understand exactly what the Kryptonians are saying to each other. For starters, how about this important panel? I don't know about you, but I have a list of items which I dream of owning one day but haven't found yet. Or in some cases haven't found for the right price. So here is my 'Dear Santa' list ... a list hopeful for holiday miracles that probably won't happen. 1) Action Comics #252 - the first appearance of Supergirl. In mint condition it goes for just under $3000. I have seen issues in a variety of conditions offered on EBay for several hundred. I don't have that much free money nor would I want to buy something without looking at it first. I actually came close to getting a copy a few years ago. I was at a convention and a dealer had a relatively inact, albeit beat-up, copy and was asking $200. I pulled out every dollar in my pocket ... $140 ... only to be told it wasn't enough. This is the 'grail piece' for me. I wonder if I will ever own it. I don't think I have been a good enough boy for Santa to bring it to me. 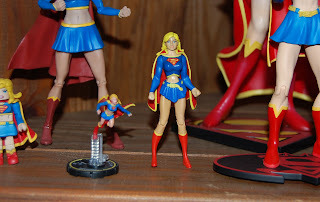 2) Gary Frank Full-sized Supergirl statue, issued by Bruckner - I have the mini-statue which is beautiful. 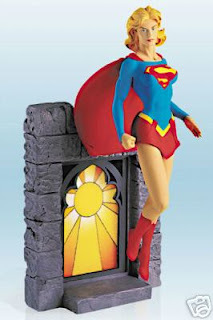 I love the Peter David Supergirl run and would love to have this full size statue as part of the shrine. As it is out of production, prices on the web run for around $250. I also came close to getting this. I was in Toronto at a conference and went into a local comic book store. There was the statue on sale for 50% off - or $200 American. I pulled out all the cash I had in my wallet ... $160 ... and was told it was not enough. 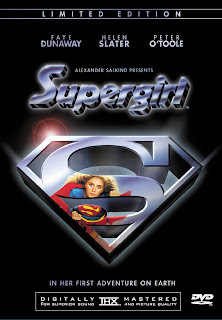 3) Limited edition Supergirl Movie DVD - Okay, a confession. I haven't seen the Supergirl movie in close to 20 years. I know ... I know. And I don't own a copy. Of all the things that seem like a possibility for me to find and purchase, this is it. I would even take the 'not Limited Edition' version. I suppose the time is right for me to use some Christmas money to seek this out and get it. 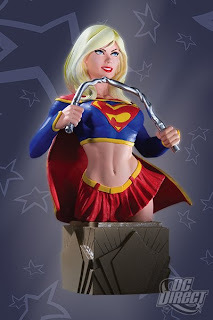 4) Micheal Turner Full-sized Supergirl Statue, issued by Bruckner - I just like this statue. I like the 'floating' feeling of Kara and the crystal base. It goes for around $300 on-line. I haven't seen this one in person enough to offer an amount that is not enough. 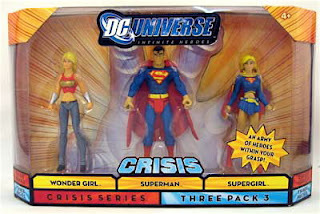 5) Infinite Heroes Action Figure Three-pack, including Supergirl - This is the item most likely to land in my stocking. Available for around $20 off the web, it includes a Kara figure which has received some praise on the internet. Looks pretty cool and would be a nice little addition to the shrine. While it is not a grail piece, it is easily available and so winds up on this list. March solicitations were posted on the DC website last week. While there are only a couple of guaranteed Supergirl sightings, this is the first month where the Super titles get a bit of a makeover. And as that will impact Kara, I figured I would showcase them here. A little orange cat with a big attitude shows up on the scene, but is he friend or foe? And Lena makes a discovery that may change her friendship with Linda forever. We all had heard that Streaky would show up in this title and it looks like this is the issue. Hopefully he is friend and not foe. But more intriguing is the first mention of a character named Lena! 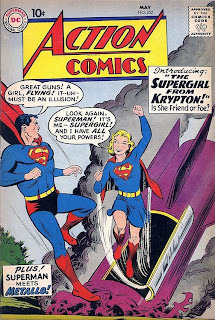 We old-timers remember the Silver Age Supergirl's friend Lena Thorul, the sister of Lex Luthor who had ESP powers. She didn't know she was Luthor's sister and he even used his powers to keep that knowledge hidden from her. A friend of Linda Lee's named Lena ... that's gooey sweet news! So the new series is called World of New Krypton ... maybe an homage to the old World of Krypton mini-series? My guess is this series revolves around the survivors of New Krypton going around the universe and placing the stolen Brainiac cities on appropriate planets. We have heard about Braal, Winath, and Tharr being in there. Maybe more Legion home worlds are in too? To give the full details of this story would spoil the dramatic finale of the "New Krypton" crossover, and we don't want to do that! Suffice to say, a "World Without Superman" is a very dangerous place, indeed, and the only thing standing between the good (and not so good) folks of Earth and an impending shadow of doom are the all-new Nightwing and Flamebird!Eisner Award-winning writer Greg Rucka (FINAL CRISIS: REVELATIONS) teams with rising star Eddy Barrows (TEEN TITANS) to kick off a bold new era for ACTION COMICS! This is the new Superman title direction I am most intrigued about. Who are behind the masks? I hope we'll know by this issue. I really enjoy Rucka prior works (outside of his 2 Candor issues in Supergirl) so I have high hopes for this run. 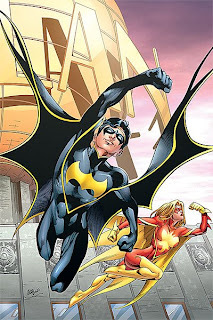 And I really like Eddy Barrows work too, especially his Teen Titans stuff. This should be a blast. 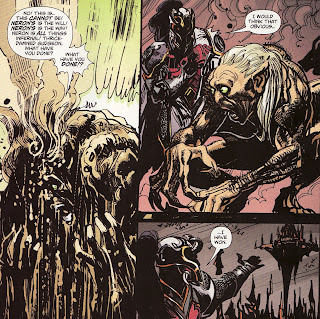 Vril Dox – the son of Brainiac – finds himself fleeing from the universe's deadliest bounty hunters as he tries to figure out who stole his intergalactic L.E.G.I.O.N. police force from him. But the more he learns, the less he likes! Guest-starring Supergirl. I still don't know if I am in for the long haul with this title. But the first 2 issues star Kara and are written by Tony Bedard, so I will give it a try. Bedard did a very credible job with Kara in his issues on her own title and her last few issues as a member of the Legion. As a fan of the Legion of Super-Heroes, and as someone who collected L.E.G.I.O.N. a while ago, this title might find a spot on my pull list. "Who is Superwoman?" part 3! Supergirl continues her manhunt for Reactron, determined to bring him to justice for the heinous crimes he committed in "New Krypton"! Meanwhile, Lois Lane and Inspector Mike Henderson investigate the appearance of a dead body in Metropolis Harbor. Whose body is it and what could it have to do with the new Woman of Steel? Find out as the big mystery of 2009 continues! I am pretty excited for this storyline too. Nothing like a good mystery in a title to get fans interested. I remember the fervor for 'Who is Sensor Girl' so many years ago. The picture above is on the DC site as the cover, but that is Jamal Igle's splash page to end issue #35. So either Josh Middleton hasn't finished the cover or it reveals something the powers that be don't want us to know. But I also like that the supporting cast seems to be growing with the introduction of old friend Inspector Henderson. Sounds like this title will continue to roll into 2009. Following the startling events of "New Krypton" and the shocking occurrence in the Phantom Zone, Earth finds itself without its greatest protector! 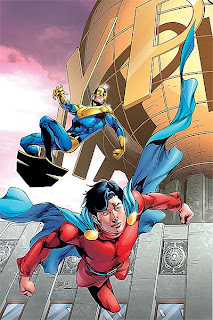 Luckily, Metropolis still has a few heroes, like Mon-El and the Guardian. But after years of knowing nothing but the solitude of the Phantom Zone, how will Mon-El acclimate himself to society? And the recently returned Guardian has his hands full with his new position in the Science Police. How can they fill Superman's shoes? They'd better figure it out fast, because dangerous mysteries abound which will carry all the way into 2010!The highly acclaimed writer-artist team of James Robinson and Renato Guedes continue their run on SUPERMAN with or without The Man of Steel! This is the Super title I am least interested in. I have never been interested in the Guardian as a character. And Mon-El? I have no idea what his back story is in the current continuity. Will Robinson be able to hook me? I guess we'll see. Ahh, but there was one more solicitation! Terry Dodson adds his vision of Supergirl to the popular WOMEN OF THE DC UNIVERSE bust line! 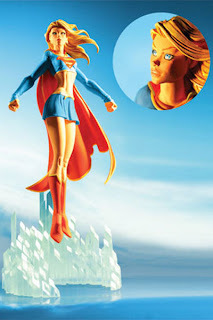 Kara Zor-El, the classic Supergirl, shows her strength by bending a steel bar, while perched atop a Metropolis inspired base. 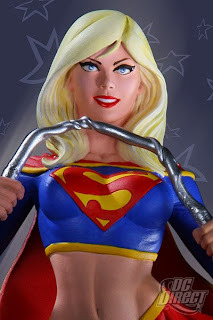 The base complements both the previous Supergirl bust from the Adam Hughes' bust line, as well as the upcoming Superman bust from the new HEROES OF THE DC UNIVERSE line! What a great statue and a worthy addition to the shrine when it is released! I like Dodson's art and this bust looks wonderful. A happy and strong Kara bending steel in her bare hands! I do like the fact that the base of this bust is the same as the base of Adam Hughes' Supergirl bust. It gives some continuity, some theme to the works. And a half-shirt but a red skirt! I haven't seen that combo before. Perhaps a sign of things to come in her own book? This hand-painted, cold-cast porcelain bust measures approximately 5.75" high x 3.5" wide x 2.25" deep, is packaged in a 4-color box and is manufactured to order. If your local comic book store is like mine, they will want a down payment before they will order one for you. I plan on taking some of my Christmas fun money and plopping it down for this! So not a bad month overall. Hopefully we will be closer to knowing who Nightwing, Flamebird, and Superwoman are by then! Poll Results: Who Is Superwoman? Final Crisis #5 Out Next Week! Poll 4: Who Is Superwoman?